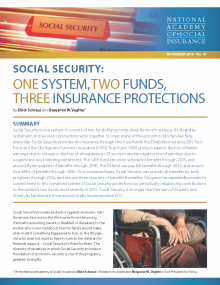 Summary: Social Security is one system. It consists of two funds that provide three forms of insurance. Its disability, retirement, and survivors protections work together to cover many of the economic risks families face every day. Social Security provides this insurance through two trust funds: the Disability Insurance (DI) Trust Fund and the Old Age and Survivors Insurance (OASI) Trust Fund. OASI protects against the loss of family earnings due to old age or the loss of a breadwinner. DI protects workers against loss of earnings due to a significant, work-limiting impairment. The OASI fund can cover scheduled benefits through 2035, and around three-quarters of benefits through 2090. The DI fund can pay full benefits through 2023, and around four-fifths of benefits through 2090. On a combined basis, Social Security can provide all benefits for both programs through 2034, and around three-quarters of benefits thereafter. Congress has repeatedly proven its commitment to this combined system of Social Security protections by periodically rebalancing contributions to the system’s two funds, most recently in 2015. Social Security is stronger than the sum of its parts, and American families are more economically secure because of it.